MBABANE, Jun 5 2014 (IPS) - For months, Nonkululeko Msibi could not find her voice each time she wanted to share the news to her husband. 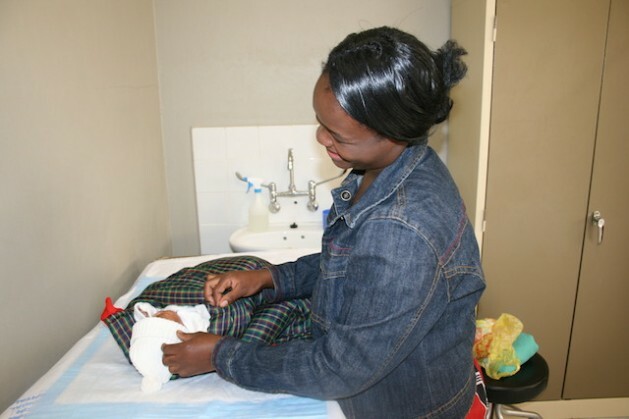 She had learned that she was infected with HIV at the age of 16 when delivering her firstborn baby at Swaziland’s Mbabane Government Hospital. Her biggest fear was to be thrown out of their marital home should he believe that she had brought HIV into the family. Despite being put on antiretroviral treatment (ART) at the baby’s birth and living two kms away from the clinic, where she could easily refill her prescriptions, her daughter contracted HIV, possibly through breast milk. “Because I did not disclose my status, I failed to convince my mother-in-law that I had to breastfeed exclusively,” said Msibi. Her second baby is also HIV positive because, she says, the clinic failed to give her nevirapine, although the nurses knew her status. “I don’t know why this happened,” she said. Born and bred at rural Motshane, about 15 kilometres from the capital city of Mbabane, Msibi dropped out of school in Grade 3 and got married at the age of 15 when five months pregnant. A product of a broken family, with both her parents deceased, marriage is the most important thing in her life. “There must be someone to look after you and your children, especially if you’re unemployed like me,” said Msibi. So, when she received the HIV diagnosis, she imagined her world falling apart, did not tell anyone and did not follow ART properly. But she is not the only woman in this kind of dilemma. “We realised that some women do not return to health centres within the stipulated timelines,” said researcher Thandeka Dlamini. She and other researchers set out to find why married women start ART late or drop out. This matters because in July Swaziland will roll out Option B+, the latest treatment recommended by the World Health Organisation for HIV positive mothers. Option B+ consists of lifelong provision of ART to pregnant women, regardless of their CD4 count. CD4s, or helper cells, fight infections in the body. Since last year, Option B+ has been provided to 600 women to test feasibility, acceptance and clinic readiness. Soon it will be offered to the four out of ten pregnant women who are HIV positive. Among these, women aged 30-34 showed the highest prevalence – more than half were HIV positive in 2010. According to Dlamini, in this conservative country, where women were considered minors until not long ago, wives must obey their husbands, even if they oppose ART or prefer traditional medicine. Dlamini said an HIV diagnosis threatens married women’s sense of security because they fear being cast out by their spouses or in-laws. “Submission might result in death, revolt can result in life, but threatens the loss of dignity and the refuge found in a marriage, and can bring shame when a marriage fails,” said a 25-year-old married woman quoted in the study. National HIV prevalence is 26 percent among people aged 15-49, and 5,600 women were newly infected with HIV in 2012, according to the United Nations. Two thirds of infections are among women aged 25 and over – in their married, childbearing years. Although the 2007 Swaziland Demographic and Health Survey reports that both married and single women have a high HIV prevalence, they are faced with different choices when it comes to ART. Single women can take a decision on their own; married women can’t. Dr Velephi Okello, senior medical officer at SNAP, said the findings will help strengthen its HIV communications strategy. “This study has helped us understand why women are either dropping out or initiating ART late,” said Okello. The 2013 Global Report of the Joint United Nations Programme on HIV/AIDS (UNAIDS) shows that nine out of ten Swazis remain on ART after a year. But Okello said one dropout is one too many. “We need to understand the barriers they encounter at social level so that we help them stay on treatment,” said Okello. Dlamini recommends empowering married women with skills to negotiate access to ART, and researching how some women successfully navigate this tricky situation. One such woman is Msibi, now 24, who is on treatment together with her husband. “When my firstborn fell seriously ill, I realised I had to disclose,” she said. Counselling from health workers helped her find the voice to break her silence. Msibi approached her mother-in-law, who already suspected that the child was HIV positive. An HIV test confirmed her fears. “But that made it easy for me to disclose to my husband, who found it difficult to accept at first, but eventually he did,” she said. Later he trained as an HIV/AIDS counsellor at the local clinic, and the couple now helps each other follow ART carefully.